SUNAIR® offers only the best acrylic and mesh fabric for your awning or screen from all major manufacturers. We also offer stock fabrics from some of the best brands, and their most popular colors. We invite you to review our fabric collection. Please feel free to ask your SUNAIR® dealer which mesh or acrylic fabric is best for your application. Standard valance styles are listed here. Some styles may vary depending on the pattern and where the stripes fall. If a custom valance is required, include a well-dimensioned sketch with the order as well as instructions on style. 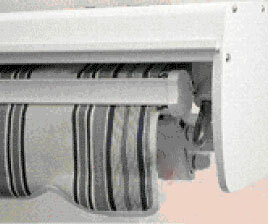 Our standard valance is "E", if no valance style is specified, we use "E".